Drug-dealing appears to be down in several major American cities, but it's really just a statistical oddity: someone's got teenagers doing the dealing, and juvenile charges don't appear in the crime stats. 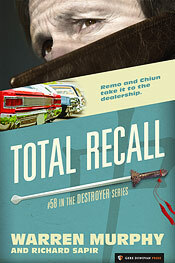 The trail leads Remo and Chiun to Detroit, where they discover that the newest engine of commerce in the Motor City may be high-octane heroin, lining the pockets of some very well-off autoworkers' kids. Autoworkers who are all congregants of a rather...unusual...new church.